For my CS 3750 class, User Interaction Design, we were asked to brainstorm, detail, and prototype a new device. The theme is mobility. My group decided to build Health Watch. 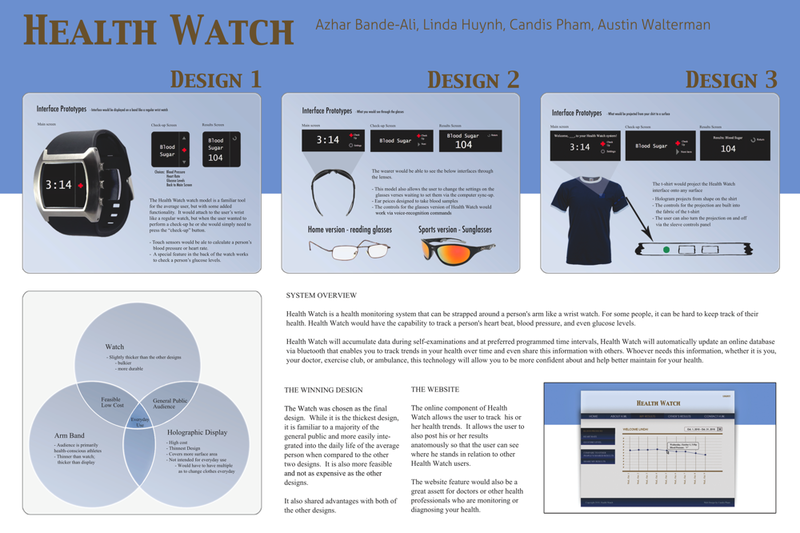 Health Watch is (in theory :P) a health monitoring system that can be strapped around a person’s arm like a wrist watch. For some people, it can be hard to keep track of their health. Health Watch would have the capability to track a person’s heart beat, blood pressure, and even glucose levels. Health Watch will accumulate data during self-examinations and at preferred programmed time intervals, Health Watch will automatically update an online database that enables you to track trends in your health over time and even share this information with others. Whoever needs this information, whether it is you, your doctor, exercise club, or ambulance, this technology will allow you to be more confident about and help better maintain for your health. For any adult wanting to keep track of their health, this interface could be programmed to automatically update and be tracked by healthcare officials. Health Watch will simplify the healthcare process and tracking for everyone. …. so why am I telling you all of this? … all graphics and web design and development done by yours truly ^_^ … as always, comments and suggestions always welcome! ~ by Candis on November 22, 2010.